- Player 4, 5 and 6 are midfielders. - Player 1 has the ball. - Player 3 cuts from the high crease to set a pick for player 2. - Player 4 does a “V” cut (at the same time) and set a pick for player 6. - Player 5 supports up top. - (Player 5’s defender may slide down for and adjacent slide). - Player 1 dodges looking score or make pass. - Player 6 cuts looking for a pass from 1. (keep distance from 1). - Player 2 looks for pass from 1 after cut off 3’s pick. - Player 4 looks for scape lane after setting a pick. - Player 3 rolls to “X” for back up and supports. 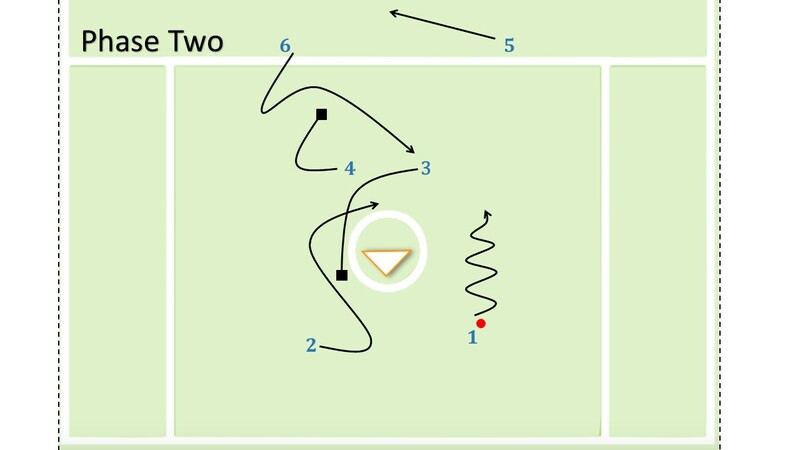 - If 1 is not able to score, 2 and 6 are not open, player 1 passes to player 3.